MONTPELIER – Vermont’s state government has finally found a way to increase revenue that everyone can agree on. While Republicans generally oppose new taxes, the vote was unanimous on bill H.549, imposing tariffs on all maple products imported from out of state. 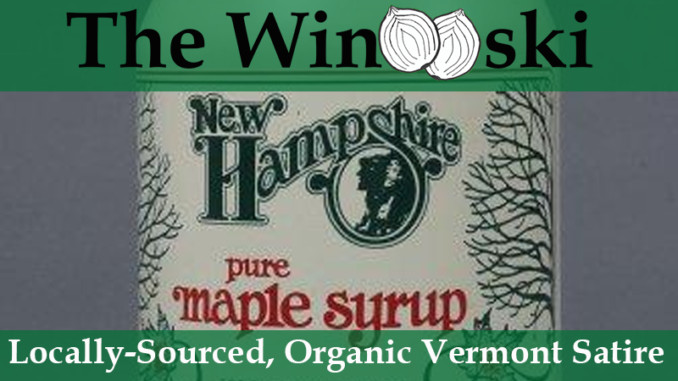 The bill, introduced by Rep. Amber Darke of Bradford, imposes a 15% tariff on maple syrup, maple butter, maple candy, maple cookies, and any other products that use maple sap from outside the state. The bill also imposes a 30% tariff on imitation maple products, such as Mrs. Butterworth’s or Aunt Jemima syrups. The debate on the house floor was unusually brief, as a consensus quickly formed around the idea that the bill would encourage Vermonters to buy local, and would not affect most residents due to the strong stigma surrounding use of non-Vermont or imitation syrups. “You know how expensive our syrup is in Iowa?” shouted Rep. Yusap Boyle of Williston. “That’s how much corn syrup should cost in Vermont!” The cheers from Rep. Boyle’s colleagues led House Speaker Johnson to call for an early vote. The governor is expected to sign the bill later this week, although Vermonters should not notice much of a difference when it takes effect in July, as no Vermonter would ever purchase any of the products affected by the bill.